Perry Tech is one of many treasures in central Washington. We're proud to call Yakima our home. Here, you won't waste your time fighting traffic or dodging the rain. Our inviting commutes and climate mean more time for you to enjoy life. With an average of 300 days of sunshine a year, you can savor your time spent outdoors- whether you'd like to go for a bike ride, golf, visit one of many breweries in our area, or explore wine country. Our climate has four distinct seasons – you can enjoy locally-grown fruit and vegetables, float the river in the summer, or head to the mountains nearby when the snow begins to fall in winter. Yakima also has an active arts community and plenty of live entertainment. Compared to larger cities, the cost of living is much lower. You'll be able to make the most of your money while you complete your education at Perry Tech. 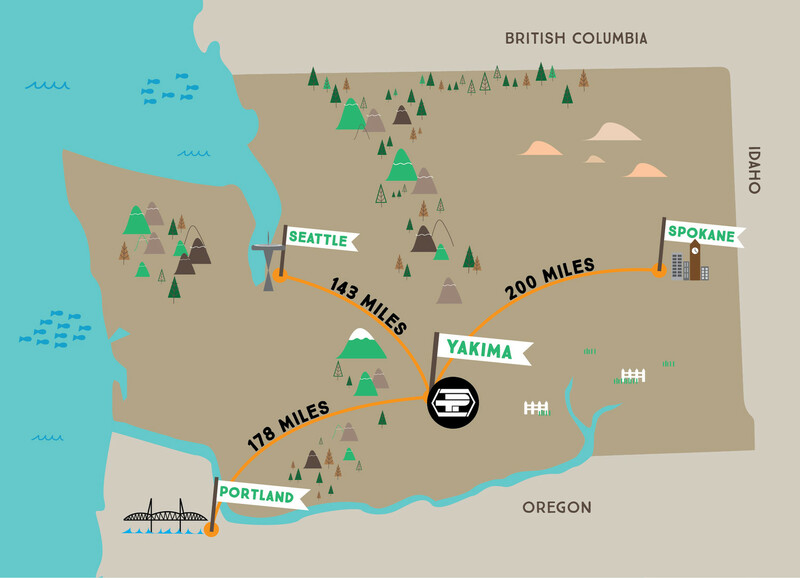 Located in the heart of central Washington, Yakima is not far from several larger cities- 143 miles southeast of Seattle, 200 miles southwest of Spokane, and 178 miles northeast of Portland.